Ronald Gary Hayes EDDINS "Jr" [Parents] was born on 25 Nov 1970 in Fort Worth, Tarrant, Texas. Ronald married Michell Lynn ROSSI on 31 Jul 1994 in Fort Worth, Tarrant, Texas. Michell Lynn ROSSI [Parents] was born on 31 Jan 1971. Michell married Ronald Gary Hayes EDDINS "Jr" on 31 Jul 1994 in Fort Worth, Tarrant, Texas. Emily Sumner EDDINS was born on 11 Jul 2000 in Flowermound, Denton, Texas. Ethan James EDDINS was born on 12 Feb 2002 in Flowermound, Denton, Texas. Anthony James ROSSI. Anthony married Cherly. Cherly. Cherly married Anthony James ROSSI. F i Michell Lynn ROSSI was born on 31 Jan 1971. 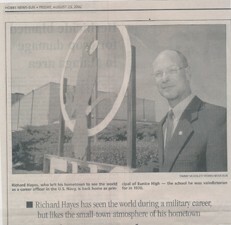 Richard Davis HAYES [Parents] was born on 19 Sep 1952 in Hobbs, Lea, New Mexico. Richard married Paula Beth SHANKS on 15 Jun 1974. The marriage ended in divorce. Paula Beth SHANKS [Parents] was born on 21 Mar 1953 in Eunice, Lea, New Mexico. Paula married Richard Davis HAYES on 15 Jun 1974. The marriage ended in divorce. F i Kimberly Dawn HAYES was born on 30 Jan 1978. Gary HAYES was born about 1985. Michael HAYES was born about 1987. Sharon HAYES was born about 1989. John Peter COLERICK [Parents] was born on 28 Oct 1889 in , , Nebraska. He died on 28 Apr 1973 in Aliance, Box Butte, Nebraska. John married Mary Ethel SISLEY on 28 Oct 1925. Mary Ethel SISLEY [Parents] was born on 8 Feb 1894 in Alliance, Bux Butte, Nebraska. She died on 23 Apr 1985 in Alliance, Bux Butte, Nebraska. Mary married John Peter COLERICK on 28 Oct 1925. F i Shirley Darlene COLERICK was born on 11 Dec 1933. She died on 2 Jan 2006. Rance COLBORN was born on 25 Apr 1958 in Eunice, Lea, New Mexico. Rance married Stacy. The marriage ended in divorce. Stacy. Stacy married Rance COLBORN. The marriage ended in divorce. James Jackson BROWN was born in 1872 in Winkler, Freestone, Texas. He died in 1918 in Winkler, Freestone, Texas. James married Mary Elizabetrh LAYMAN. Mary Elizabetrh LAYMAN was born on 20 Aug 1876 in Bokchito, Bryan, Oklahoma. She died in Dec 1956. Mary married James Jackson BROWN. F i Margaret Mae BROWN was born on 6 Jun 1905. She died on 7 Jan 2001. RONEY. RONEY married Mary Elizabetrh LAYMAN. Mary Elizabetrh LAYMAN was born on 20 Aug 1876 in Bokchito, Bryan, Oklahoma. She died in Dec 1956. Mary married RONEY. Frank SHERMAN was born about 1923 in Near Coeur d'Alene, Kootneal, Idaho. Frank married Mary Ann WALKER. Mary Ann WALKER [Parents] was born on 20 Jun 1924 in Winkler, Freestone, Texas. She died on 7 Jul 2001 in Corsicana, Navarro, Texas. She was buried in Resthaven Memorial Park, Corsicana, Navaroo, Texas. Mary married Frank SHERMAN. Billy Joe MC CANN was born on 20 Aug 1927 in , Freestone, Texas. He died on 29 Jul 1987 in Corsicana, Navarro, Texas. Billy married Mary Ann WALKER on 16 Sep 1949. Mary Ann WALKER [Parents] was born on 20 Jun 1924 in Winkler, Freestone, Texas. She died on 7 Jul 2001 in Corsicana, Navarro, Texas. She was buried in Resthaven Memorial Park, Corsicana, Navaroo, Texas. Mary married Billy Joe MC CANN on 16 Sep 1949. F i Sharon Kay MC CANN was born on 18 Jun 1947. She died on 13 Nov 2014. James Watt WALKER [Parents] was born on 14 Feb 1926 in Winkler, Freestone, Texas. He died on 17 Apr 1982 in Los Lunas, Valencia, New Mexico. James married Margaret Louise MURPHY. Margaret Louise MURPHY was born on 7 Sep 1928. Margaret married James Watt WALKER. F i Caroly Sue WALKER was born on 28 Apr 1952. F ii Barbara Ann WALKER was born on 12 Oct 1953. F iii Sherry Lynn WALKER was born on 10 Apr 1957. M iv James Anderson WALKER was born on 12 Jun 1959.